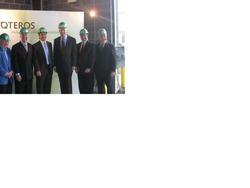 U.S. Rep. Richard Neal and Chicopee Mayor Michael Bissonnette join Qteros at cellulosic ethanol pretreatment plant launch event. We believe that this technology is transforming the way we produce fuel, and the work we are doing at this pilot plant is a critical step in scaling up our process. Business leaders, politicians, and venture capitalists were on hand today as Qteros officially launched the build-out of their cellulosic ethanol pretreatment plant site in Chicopee. Located adjacent to the Westover Air Force Base, the plant will create both short and long-term green jobs, and will help stimulate the economy of Western Massachusetts. Speakers included U.S. Rep. Richard Neal, Secretary of Housing and Economic Development Gregory Bialecki, Chicopee Mayor Michael Bissonnette, and Qteros CEO Bill Frey. Today’s event kicked off the final phase of construction that will turn the existing 16,000-square-foot structure into a state-of-the-art pilot plant at an expected cost of $3.2 million. This Qteros pretreatment plant will also have the potential to become the site for the company’s full-scale pilot and manufacturing plants, providing even more jobs and growth to the region. The plant is expected to be in small-scale production by the end of this year. In 2010, the full-scale plant—if funded—will come online. The technology is ready, Qteros said, and the company is prepared to move these projects forward. Qteros is making rapid progress toward commercialization of its unique Q Microbe™, a game-changing technology with the ability to convert virtually any form of biomass into ethanol in a single step. The Q Microbe™ works on corn stover (all the non-food portions of the corn plant), switchgrass, woody biomass, sugar cane residue, and even cellulose derived from municipal wastewater sewage sludge, among other feedstocks. The company recently announced that it has achieved unprecedented lab results in the performance of its one-step conversion process. The Q Microbe™ can achieve outputs of 70 grams of ethanol per liter of fermentation broth, or 9 percent ethanol by volume, surpassing what is considered to be the threshold for commercial production of cellulosic ethanol, 50 grams per liter. Qteros has said this breakthrough makes its process the most economic to date. Qteros’ technology is based on the discovery in Massachusetts of a microbe with the ability to convert virtually any cellulosic material to ethanol in a single step, far more efficiently than leading competitors. Dr. Susan Leschine, a microbiologist at UMass Amherst, discovered the “Q Microbe™” on the shores of the Quabbin Reservoir. For more information about Qteros, or if you’re interested in speaking with a Qteros spokesperson, please contact Patricia Charles at 301-887-1060 x111 office, 703-600-9324 cell, or allison (at) renewcomm (dot) com. Qteros is a venture-backed company committed to delivering innovative process technologies for clean transportation fuels that reduce greenhouse gas emissions at a price competitive with gasoline. Qteros is scaling up a unique microbial solution for converting non-food plants and waste into clean transportation energy. The Qteros scientists and business team are dedicated to producing liquid fuels to achieve a sustainable solution to the world’s growing energy needs. For more information, see http://www.qteros.com.